When approached by McCormick to be one of their Health & Wellness Content Partners, there was no decision to be made. No matter what level of cooking one participates in, spices and flavor are a must. There are countless ways to make a recipe full of flavor, some healthier than others (cough, cough…saturated fat, salt, and sugar…not-so-healthy, cough cough). My pantry and cabinets are chock full of spices – I’m sure I have every last one in my arsenal of flavor. As someone who loves to cook, I understand the significant role of spices in delicious, healthy cooking. I’ve never had a great burger that didn’t have some garlic powder and onion powder thrown in. Have you ever had pancakes with cardamom? I’m sure you’re not alone if your answer is no – but seriously, get on that. Indian dishes are so fun to recreate because their focus is on the perfect combination of spices – everything from garam masala (a blend of spices) to cumin to cayenne to turmeric. And the resulting beauty of color? Stunning. 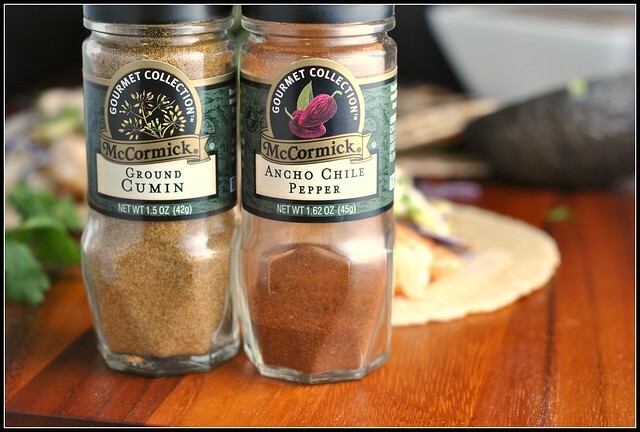 Spices can be easily incorporated into marinades, dressings, breadings, batters, mixes, doughs, dry rubs…you name it! If you’re not adventurous with spices, it’s time to expand your horizons. Some of you may be aware that in recent years, the food pyramid transformed into “MyPlate”. Simply put, nutrition was overwhelming, hard to quantify and qualify in daily living, and entirely over-complicated for the simple fact that most of us would simply benefit from better balance. More good, less not-so-good. More specifically, more fruits, vegetables, and whole grains and less processed foods that are high in salt, sugar, and unhealthy fats…and probably less protein, too. Have you weighed a store-bought chicken breast in recent years? That baby may weigh upwards of 12-14 ounces – a far cry from an actual serving of chicken. And so began the movement to create a plate (MyPlate) that was half fruits and vegetables, and roughly ¼ grain and ¼ protein with a serving of dairy. Balance…with more of the good. Personally, I like the plate method, but it has its drawbacks. For someone like myself who rarely sits down to a meal comprised of individual components of fruit, vegetable, grain, protein, and dairy, the MyPlate still leaves room for some interpretation. Take for example these tacos (they tasted even better than they look, promise!). Corn tortillas offer up a nutritional edge over white flour tortillas by way of vitamins, minerals, and perhaps most importantly, fiber. Plus, they taste way better (heat them over a range burner for a slight char – mmmm!!). Shrimp are a low-calorie protein that cook super quickly, making them perfect for a weeknight meal. Plus, they marinade quickly and take on lots of flavor. In the marinade, ancho chili powder and perhaps my most favorite spice, cumin, are used to add Mexican flavor and depth. A bit of salt (just a bit!) helps to accentuate the flavors themselves…and the tequila, honey, and lime – well, the combination is just amazing. I suggest throwing the shrimp in the marinade and grabbing a quick workout before dinner as they swim in the flavor. 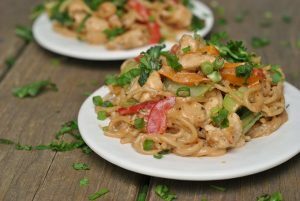 From that point, this meal comes together in minutes with flavonoid-packed onion and antioxidant rich fresh cilantro, as well as healthful avocado (technically, a fruit!). The red cabbage is not only full of anthocyanin but it’s also stunning and adds the perfect crunch to the taco. 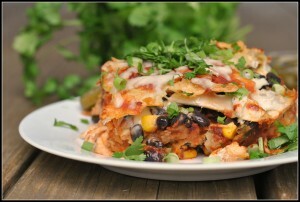 Adding a side of corn would be a great accompaniment to this meal…or perhaps some Vegan Crock Pot Refried Beans? Talk about good for you food that’s packed with flavor (spices!). In a medium bowl, whisk to combine the salt, honey, juice of 2 limes, tequila, cumin, and ancho chili powder. Add the shrimp and thinly sliced onion; toss well to coat shrimp and onion well; refrigerate for 1-2 hours. In a large skillet, heat the olive oil over medium-high heat. From the marinade, add the onion and then the shrimp, cooking 4-5 minutes or until onion are tender and translucent and shrimp are pink. Meanwhile, blend or food process the Chipotle Cream ingredients together and transfer to a small bowl for serving. 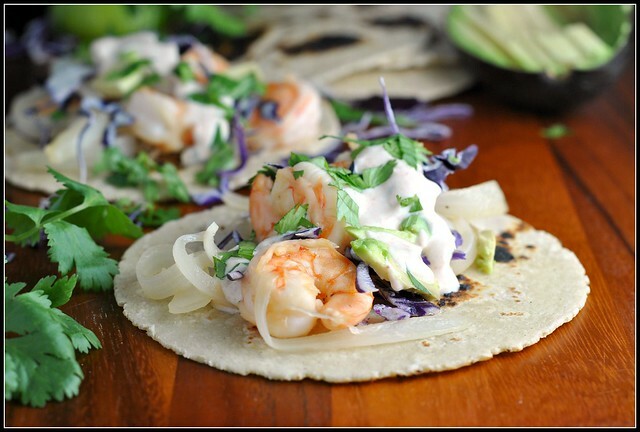 To assemble tacos, place 2 ounces of shrimp and several onion slices on each tortilla. 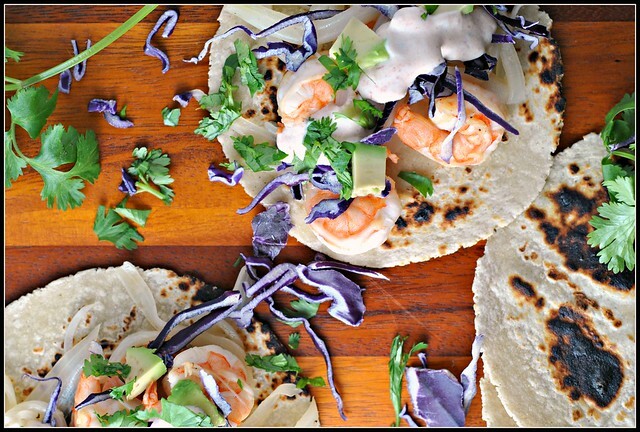 Top with red cabbage, avocado, cilantro and the Chipotle Cream. Serve immediately. The onions need a bit longer to cook than the shrimp, so try using tongs to add the onion first and then the shrimp to avoid over-cooking the shrimp. Using spices and combinations of spices not only helps to increase flavor and taste, but aids in decreasing the use of salt, sugar, and fat in most recipes. Get creative, get cookin’! Disclaimer: I was compensated for this post as a contribution to the 2014 McCormick Health & Wellness Blogger Program. All opinions are my own. You had me at tequila! 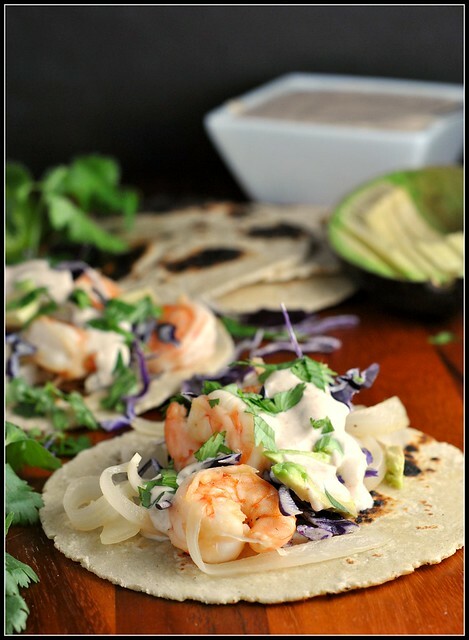 These tacos look delish,and you are so right about spices! Speaking of spices, I’ve been reading a lot about the health benefits of turmeric recently and trying to get more in my diet…however, I’m not in love with it’s flavor (I don’t dislike it, but it’s very ‘earthy’!) Any suggestions on uses or other spices to pair it with? Thanks! Gorgeous, Nicole! Is it lunch time yet?? I love a well spiced taco with tons of crunch on top, so the cabbage fits the bill nicely. Yum! Saved this one for later. Question – can corn tortillas be frozen? The package comes with SO many and I can’t use them all before they bite the dust. I have Garam Marsala too, but I don’t know what to use it in, other than chili. Any ideas? This is the second time I’ve made these and they are delicious! Love this recipe.